New Delhi, Feb 13 (IANS) Top opposition leaders on Wednesday called for the ouster of Prime Minister Narendra Modi as they rallied in the national capital in a show of strength but some of them admitted to differences within their ranks ahead of the Lok Sabha battle. In fiery speeches, Chief Ministers Mamata Banerjee (West Bengal), N. Chandrababu Naidu (Andhra Pradesh) and Arvind Kejriwal (Delhi), whose AAP organised the public meeting near Jantar Mantar, described Modi and BJP President Amit Shah as threats to Indian democracy. 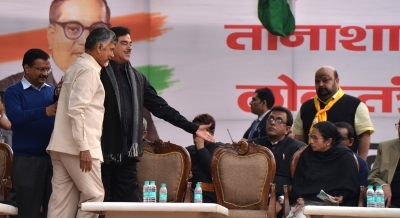 The rally, which drew thousands of mainly Aam Aadmi Party (AAP) supporters, also saw the participation of NCP chief Sharad Pawar, Farooq Abdullah of National Conference, Sharad Yadav, Ram Gopal Yadav of Samajwadi Party, DMK's Kanimozhi, CPI-M's Sitaram Yechury and rebel BJP MP Shatrughan Sinha among others. "The current situation is worse than the Emergency," thundered Trinamool Congress leader Banerjee, saying attempts by the Modi government to frighten her by sending CBI officials will not succeed. Naidu expressed the hope that Modi will become "ex-Prime Minister soon". The Telugu Desam Party President attacked the Modi government over such issues as demonetization, farm distress, rising unemployment, misuse of CBI and other agencies as well as attacks on the federal structure. Congress leader Anand Sharma, who took part in the rally despite persisting Congress-AAP tensions in Delhi, said there will be agreements among opposition parties at some places and none at some others. "However, attempts should be made in the country's interest." Warning that the BJP was using the communal card ahead of the elections, Abdullah asked the opposition parties to forget "conflicts among ourselves" to forge a united anti-Modi alliance. The usually combative Kejriwal asked people to pick an educated person as the next Prime Minister. "Last time you appointed a 12th Class pass man for the post," he said as the crowd roared. "This time, vote for an educated man. A 12th pass is not wise enough... He does not consult anyone." Pawar too took a dig at Modi and said the opposition needed to unite to "challenge the autocracy". He added: "It is imperative for the autocrat to go in the interest of the poor and to save democracy." This was the biggest gathering of opposition leaders from across the country after the January 18 rally in Kolkata organised by the Trinamool Congress. CPI-M's Yechury used characters from the Mahabharata to compare them with BJP leaders. "Of the 100 Kauravas, people only know the names of Duryodhana and Dushasan. Similarly, of the many from BJP, we only know Modi and (Amit) Shah." "We have to save the nation and remove the 'chowkidar' from his post. This fight (Lok Sabha election) will be a fight between Modi and the people," he added at the event where Left leaders for the first time shared a stage with Banerjee.